← “Dazzling Darkness” – job done! The year 2011 begins……with Dylan Thomas and ancient Akkadians ! Today we took our Christmas Tree down. This day is always ‘throat-slitting day’ in the calendar of our New Year. We rarely wait for Epiphany to carry out this doleful task. After New Year’s day is over, the richly decorated, multi-coloured glowing beauty of our tree ceases to bring us comfort and magic in the heart of winter, and stands before us reproachfully (as we imagine), waiting to be dismantled, recycled. We cannot bear to prolong this post-festive inevitability. And now it’s done. Here I stand, in the bare, empty, dusted, wiped, hoovered space left behind. What comfort is to be found in this bleak moment? My husband has the right idea.He is off to the pub with my brother – the third tree-dismemberer. The need to bring comfort and cheer and significance to that cold dark time in the Northern Hemisphere, when the Sun’s warmth seems a distant longed-for memory, is a very ancient one. This thought comforts me, as it does every year. I like to feel part of the ancient river of humanity as I stand here in my 21st century bare bay window. This tree may have been sacrificed by us, but its spirit lives on in that bare window space, inhabiting another world, waiting to be given form yet again when the seasons turn and we feel yet again a powerful need to affirm that the life force is still with us – just gathering its strength in the dormancy of winter. 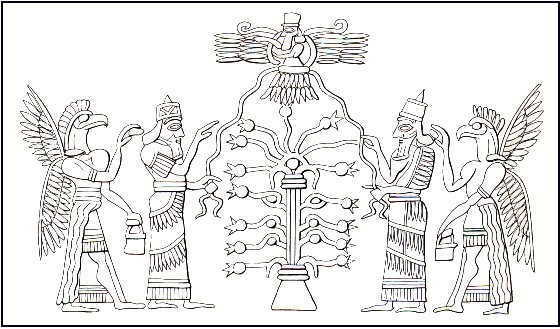 This entry was posted in Festive Greetings : 2009, 2010, 2011, 2012, 2013, 2014,2015 and tagged "And death shall have no dominion", "Tree of Life", 'Though lovers be lost, Ancient Akkadians, Christmas Tree, Dylan Thomas, Epiphany, love shall not......', New Year, Northern Hemisphere, Otherworld, Prophet Jeremiah, Romantic, Winter Solstice. Bookmark the permalink. As the third member of the team,i can only echo my sisters sentiments. Beautifully written as always. many thanks for dropping by. We have shared many a throat-slitting day….maybe I will join you and Ian in the pub, next time! This is so lovely Anne. It’s been many years since I put a Christmas tree but I can very much remember that feeling of bleakness when the tree finally came down! Like you though, I always tended to take it down as soon as possible after New Year rather than wait until Epiphany! Anne, I insist the tree stay up till Epiphany, but it is now the 11th of January and it’s still up! Of course, it’s a “fake,” otherwise we’d probably be up in flames by now. For some reason, both my husband and I have had a hard time letting go of the Christmas season this year. Our tree with its ornaments full of memories brings us not only comfort, joy and warmth; it keeps aglow the feelings of generous giving that evaporate too soon with the New Year’s Eve champagne bubbles. Left up to me, I’d keep it up year-round. I am so comforted by the fact that one neighbor still has her outdoor lights up. Here’s the hint. She has three children. Perhaps we need to keep a Christmas tree alive in our hearts always for the kid in it. It’s so synchronistic that I landed here today, because today is throat-slitting, de-decorating, and finally getting ’round to it day. Joyce, I love this. Thank you. And thank you for visiting. And for our synchronicity, which is always there. Today is my day for emailing you! Many thanks for dropping by, and for your support, Lauren!